The glaze is light and not sticky sweet. Equal parts honey or agave nectar and orange juice, crushed garlic cloves add just the right bridge between the earthy beets and sweet syrup. By allowing the roasted beets to simmer in the glaze, the flavors come together in a very unexpected and completely delicious way. 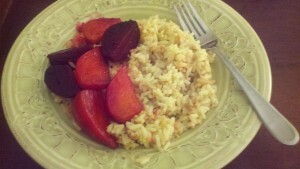 You can choose your favorite box rice pilaf, I am a Near East junkie, or cook up your own. This is a very filling, satisfying dish and great for lunch the next day though it doesn’t usually hang around that long! 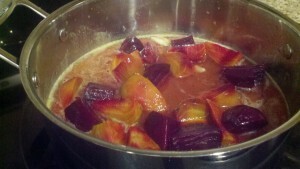 Combine all ingredients, except for the beets, over low heat. Bring up to a slow simmer. Add quartered, roasted beets to the pan, cover and very gently simmer for 20 minutes. Remove beets from the cooking liquid, you can discard the liquid, and serve on a bed of rice pilaf. 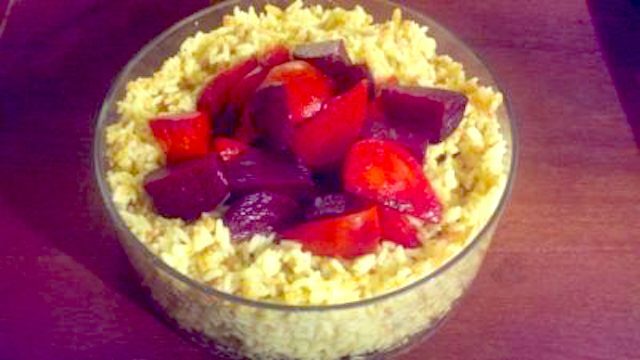 A healthy, hearty meal and guaranteed to make a beet lover out of anyone! With love and thanks to my Yiayia Mary for making a beet fan out of me at an early age – filaikia, Yiayia!